Since Jane Asher met Paul McCartney in Spring '63 she's had a problem. She's obviously very fond of Paul and terribly proud of him. But she's been an actress since she was five and is determined to make a success of her career on her own. As soon as her name was linked with Paul's, the news was flashed around the world and she was instantly famous - but not for herself and not as an actress. Any girl whose name had been romantically tied with Paul's would have been as well known. It was a terrible blow. How, in future, would she be able to tell whether people wanted to see her because of her power as a performer or merely for her friendship with a Beatle? Paul encourages her to continue with her career because he thinks she has terriic talent and goes to see her perform whenever he can. After the newspapers found out about Jane and Paul, fans began to collect outside her home. Being in the heart of London, it was easy for any Beatle-fan girl to find. Nauturally Paul - and the other boys, too - were frequent visitors to Jane's home when they were in town. They used to play discs and write songs down in the basement. Once, the exasperated Mrs. Asher threw some water at some persistent girls to try to persuade them to go away. Inside the Asher home, the phone kept ringing and unknown female voices asked for Paul. When told he wasn't there, they just hung up. Jane's father, a medical man who has to have his number in the phone book, found it all very wearing. And all Jane wanted was to be friends with Paul and go on being as good an actree as she knew how. Rumours about Jane's friendship with Paul started in October, 1963, though they had met about six months previously when she went back stage at a pop concert at London's Royal Albert Hall. After that she was often seen with The Beatles when they went to photo sessions and to parties. When she and Paul went out they were recognised and their dates became world wide news. For instance, in December, 1963, they went to see Never Too Late at the Prince of Wales theatre in London. They both enjoy plays but because Paul was spotted and mobbed they had to go home without seeing the last act. Next morning, in the newspapers, there was a picture of them both sitting in the stalls. Good publicity maybe, but it's not easy to run a boy-meets-girl friendship in the full glare of big time publicity. Jane was the first Beatle girl to become really well known, probably because she was already familiar to the public. Everyone knows her from films, television plays and appearances on panel games. Being a good conversationalist, a girl with decided and original views and a forthright but charming way of putting her opinions over, she'salways been well liked. Paul and Jane are very well suited for both are mature, straightforward and have, under all their charm, a take-it-or-leave-it approach to things. Both are toughies at heart. 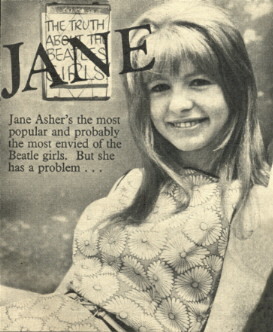 Jane has earned herself considerable respect for her adamant attitude to publicity which is only connected with her Beatle boy and not with her acting. It's paradoxical that Paul unavoidably has made it more difficult for her to make her own way in the world and prove herself in her own right. Before she met Paul, Jane had, of course, been dated by many attractive boys, including actor Albert Finney and poster Craig Douglas. Both those dates didn't make news. But in Freruary, 1964, stories leaked out, linking Paul's name with Jill Haworth, the beautiful American actress. He phoned back to England from Miami to reassure Jane that the papers had got it wrong. As soon as he got back, he drove down to Cantebury where Jane was appearing in The Jew Of Malta, to make it plain that she was the girl in his life. When they went to see a movie at the Empire Cinema in Leicestr Square, London, that same month, they had to leave seperatlely and go off in individual taxis, because they were recognised and the crowds started closing in on them. So unless they go to clubs where the people are mostly in show biz, like the Ad Lib, dates have to be carefully planned. They may go for a drive in his car or take a taxi and get out and walk round one of the quieter shopping areas, looking at clothes - both men's and girl's. They like to be quiet and they tend to be rather a serious couple when they're on their own. Marriage? There have been lots of rumours, including one that the ceremony took place on board ship, in Paris and in Kensington last year. Jane herself said, back in '63: "I'm not going to get married until I'm twenty." She was nineteen on 5th April this year.